The new edition of Environmental Law provides a comprehensive account of this topical and complex area of law, bringing within one volume the full range of law and legislation in the field. Written by a group of practicing attorneys, all with specialist experience of environmental law, it aims to cover all aspects of the area including the practice and jurisprudence of the tribunals which administer it in England and Wales, and Northern Ireland. 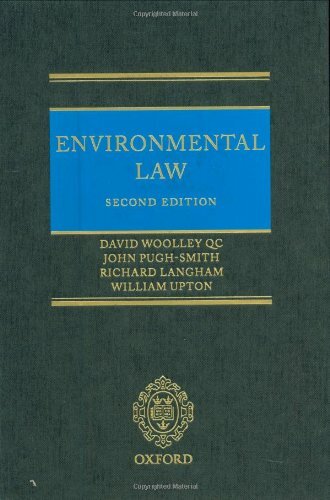 This title contains detailed coverage of the substantive environmental law areas such as pollution of all kinds, the control and management of waste and hazardous substances, contaminated land issues, and conservation. The book also examines thoroughly the regulation, enforcement of environmental law, and analyses the international and European context and its implications for the UK. The new edition of this title brings the book up to date with recent legislation such as the Clean Neighborhoods and Environment Act 2005 and considers the impact of the Planning and Compulsory Purchase Act 2004. As central government policy documents have increasingly concentrated on the control of pollution in the planning process, this title analyzes development of planning and social sustainability policies as put forward in the White Paper of May 2007 and the forthcoming Planning Bill. This book combines valuable analysis with practical guidance on the full range of topics facing the environmental lawyer.